Avaiable in Lite & Pro version. Thanks to this application, easy to use and intuitive, you can quickly and easily store all kinds of information useful to you. You are in a store and want to save the price of an item with the product. Nothing could be easier, take a photo. Do you want to quickly store your ideas? Elementary: record them with your voice. And do not miss the chance to write text. The text has been enlarged to make it more readable. You no longer need glasses. 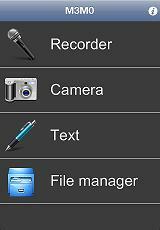 To limit the number of gestures, audio recording starts immediately.